Government data released show that U.S. ethanol exports through June stood at 927.7 million gallons (mg), up 33 percent from the first half of 2017 and on pace to shatter last year’s record of 1.38 billion gallons (bg). According to the Renewable Fuels Association (RFA), robust export markets are more important now than ever before, as actions by the Environmental Protection Agency (EPA) are undermining domestic ethanol demand. 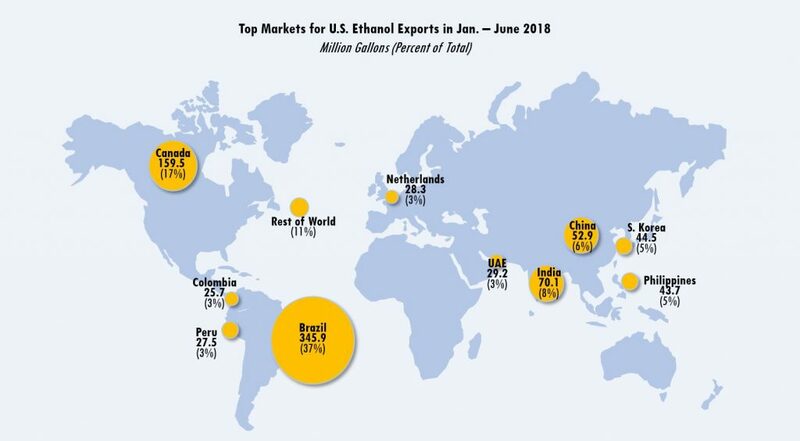 At the halfway point for 2018, Brazil had been the leading market for U.S. ethanol exports, receiving 345.9 mg—or about 37 percent of total shipments. Exports to Brazil in the first half of 2018 were up 28 percent over the same period in 2017. Canada has been the second-leading export market, with 159.5 mg of U.S. ethanol flowing north of the border in the first six months of the year. That’s up 8 percent from the same period a year ago. Other top markets for the first half of 2018 were India (70.1 mg), China (52.9 mg), South Korea (44.5 mg), and the Philippines (43.7 mg). It should be noted, however, that 99 percent of the exports to China occurred in the first three months of the year, and fuel ethanol exports to the country collapsed to zero in the second quarter as a result of increased tariffs. RFA provides monthly export updates on its E-blog (including a summary of the June data released today) and annual statistical summaries for exports of both ethanol and distillers grains.